The name Avocet comes from the Ferrarese Avosetta (This word is considered to be derived from the Latin avis - the termination expressing a diminutive of a graceful or delicate kind, as donnetta from donna (Prof.Salvadori in epist.) ; but it is spelt Avocetta by Prof. Giglioli) . The Pied Avocet, Recurvirostra avocetta of ornithology, is a wading bird who is remarkable for its bill, which is perhaps the most slender to be seen of all birds. Curving upward towards the end, its bill has given the bird two names which it formerly bore in England, - "Cobbler's-awl," from its likeness to the tool so called, and "Scooper," because it resembled the scoop with which boatmen threw water on their sails. The legs, though long, are not extraordinarily so, and the feet, which are webbed, bear a small hind toe. The Avocet's mode of nesting is much like that of the Stilt, and the avocet's eggs can hardly to be distinguished from those of the Stilt except by their larger size. The avocet is about as large as a Lapwing, and has white plumage, with the exception of its crown, the back of its neck, the inner scapulars, some of the wing-coverts and the primaries, which are black, while the legs are of a fine light blue. It obtains its food by working its bill from side to side in shallow pools, and catching the small crustaceans or larvae of insects that may be swimming therein. The Pied Avocet was, of old times, plentiful in England, though doubtless always restricted to certain localities. Charleton in 1668 says that when a boy he had shot not a few on the Severn, and Plot mentions it so as to lead one to suppose that in his time (1686) it bred in Staffordshire, while Willughby (1676) knew of it as being in winter on the eastern coast,. Pennant in 1769 found it in great numbers opposite to Fossdyke Wash in Lincolnshire, and described the birds as hovering over the sportsman's head like Lapwings. In this district they were called "Yelpers" from their cry; (see "Yarwhelp" (Godwit) and "Yaup" or "Whaup" (Curlew). "Barker" and" Clinker" seem to have been names used in Norfolk) but whether the name of Yelper was elsewhere applied is uncertain. At the end of the 18th century Avocets frequented Romney Marsh in Kent in the UK, and in the first quarter of the 19th century they bred in various suitable spots in Suffolk and Norfolk - the last place in the UK known to have been inhabited by them in that century being Salthouse, where the people made puddings of their eggs, while the birds were killed for the sake of their feathers, which were used in making artificial flies for fishing. The extirpation (ie localised extermination or loss) of this settlement of Avocets took place between 1822 and 1825 (cf. Stevenson, Birds of Norfolk, ii. pp. 240, 241). The same kind of lamentable destruction occurred in Holland and Denmark, to the extirpation probably of the species in each country. There is some evidence of their having bred so lately as about 1840 at the mouth of the Trent in England (cf. Clarke and Roebuck, Vert. Fauna of Yorkshire, p. 72). However around 100 years after their disappearance in the UK, Avocets returned to this country in the 1940s, and the success of the bird's breeding inspired the RSPB (Royal Society for the the Protection of Birds) to make the avocet the bird which has been featured on its official logo since 1970. Two species of Avocet, The America Avocet (Recurvirostra americana) and The Andean Avocet, (Recurvirostra andina), are found in the Americas; the former, which ranges as far north as Saskatchewan, is distinguished by its light cinnamon-coloured head, neck, and breast, and the latter, confined so far as known to the mountain lakes of Chili, has no white on the upper parts except the head and neck. Australia produces a species known as The Red necked Avocet, Recurvirostra novaehollandiaeor rubricollis, with a chestnut head and neck; but the European Pied Avocet Recurvirostra avocetta extends over nearly the whole of middle and southern Asia as well as Africa. The proposal (Ibis, 1886, pp. 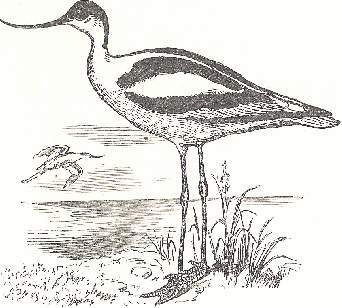 224-237) to unite the Avocets and Stilts in a single genus seems to have had little to recommend it except its novelty, and did not meet with much acceptance by systematists.